Looking casual and contemporary, Brittany shows how to wear a chin-length bob in a style that flatters a long face, or one with a slightly pointed chin. This lovely style focuses attention on the center of Brittany’s face from eyes to lips! The key factor to balance out a long face is an extra-long fringe that’s styled asymmetrically from a side parting. The pretty drape of blonde hair effectively ‘cuts off’ one corner of her forehead and shows off her fabulous blue eyes. And instead of having the long layers curving in around the chin, draw attention away from a prominent chin by styling your bob away from the face! If you’re looking for a short cut for spring/fall, why not consider this one? This short haircut is great for oval, heart, diamond shaped faces. Find more short hairstyles here. 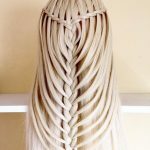 previous post Braid Hair Ideas: Cool Conch Shell Braid!